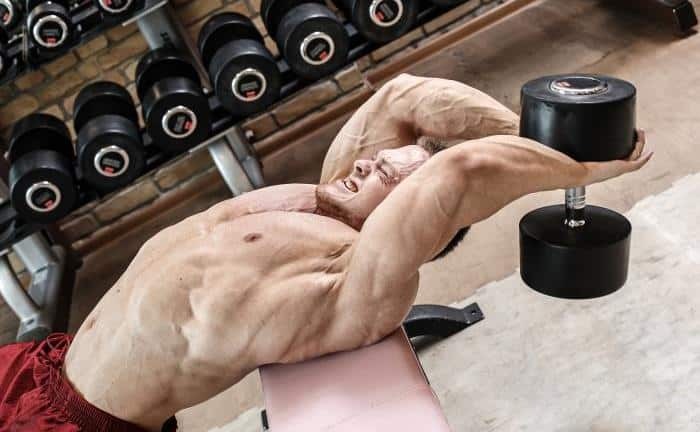 Discover the dumbbell pullover benefits and see how this isolation chest exercise might be able to help you reach your goals faster. If you are planning to add this exercise to your routine, be sure that you know how to do the dumbbell pullover. Build Upper Body Muscle. Although it’s considered to be among the isolation chest exercises (since it’s a single-joint movement), it also effectively works the triceps and lats. So get ready for thicker chest and back muscles. I should note, though, that contrary to populare belief, this exercise does not work the serratus anterior (the “rib muscles”), at least not in any substantial manner. Work the Stabilizers. The dumbbell pullover clearly does your chest justice, but it’ll also test many stabilizer muscles throughout your body; spefically those in the abs, upper back/scapular region and the gluteal muscles. Stabilizer muscles don’t actually do the work to move the weight, but they support the muscles that do by holding them steady or balanced. Poorly developed stabilizer muscles can be a “weak link” that causes a plateau. Flexibility. Although the dumbbell pullover is no substitute for a stretching routine, the stretch involved in performing the technique is effective for maintaining or improving flexibility and range of motion in your chest and shoulder region. An increase in the flexibility of this region will benefit all other related exercises in your weight lifting routine. Nice. I was researching pullovers as a movement between sets and found your website. Looking forward to reading more. Hi! I like your article. But Can you add more benefits of incline dumbbell pullovers as supposed to 3 benefits only. I’d like to know more. These are the main benefits. I guess I could expand a bit on the 3rd benefit of flexibility — really it’s good for mobility; specifically thoracic spine mobility, which is important for many exercises, like front squats and many others. Passed from my highest 1rep max with 70kg to 5reps with 70kg. Started doing pullover only the last month what a miracle. Didn’t improve so much in so little time. That’s excellent progress, thanks for sharing. The first two sentences of #1 are essentially saying the same thing. Perhaps tidy that. I’ve done this exercise from time to time over the years. I like it but I can’t “feel” the muscles it works so it’s a mystery to me. It seems logical to me that it works the chest but I’ve had some people say that it’s a lat exercise. Odd. I wonder if it would be more effective on a decline bench. Thanks for the heads up on the similar sentences.